Some NCAA football coaches might be intimidated by the idea of taking the reins of a team that went winless the previous season. But Dana Dimel, UTEP’s new head football coach, sees it as an opportunity. Dimel has faced similar adversity before. In 2002, he spearheaded a major rebuilding effort in his first year at the University of Houston, where the Cougars went 0-11 the previous season. In Dimel’s first year, Houston won five games, including an upset of eventual Conference USA champion Louisville. Dimel most recently served as the offensive coordinator, running backs coach and tight ends coach at his alma mater, Kansas State University, where he had worked since 2009. Dimel was a member of the Wildcats’ All-Decade Team for the 1980s. He received a B.A. in marketing from Kansas State in 1986. Dimel began his career at Kansas State as a graduate assistant in 1987 and was elevated to offensive line coach in 1989. He took over as offensive coordinator in 1995. Overall, Dimel spent 10 seasons at the university before accepting the head coach job at Wyoming. At the time, he was the youngest Division I-A head coach in the nation at the age of 34. Dimel’s three seasons at Wyoming produced a record of 22-13. Dimel spent 2000-2002 as the head coach at Houston. While with the Cougars, Dimel brought in the top-ranked recruiting classes in Conference USA in 2001 and 2002. He continued work on his graduate degree at Kansas State before taking over as Arizona's tight ends coach in 2005 and, eventually, run-game coordinator. In 2008, he was promoted to associate head coach. The 2008 Arizona squad finished 8-5 while posting a bowl victory for the first time in 10 years. Rodney Terry, who led Fresno State University to the 2016 Mountain West Conference tournament title and three postseason bids in the last five years, was named the 19th head coach in UTEP men's basketball history in March 2018. Terry, 49, guided Fresno State to a 126-108 record in seven seasons as head coach (2011-2018), including 20-win campaigns in four of the last five years. The Bulldogs compiled a 62-58 mark in Mountain West Conference play during the last seven years, with double-digit victories in each of the last four campaigns. "I want a homecourt,” Terry said of why he chose to come to UTEP. “We played in a very competitive league in the Mountain West. We played in many great venues. We got a chance to build that program to a very high level. But there were nights where we had to create and bring energy to the building … I know the passion when Miner basketball is playing at a very high level. You're able to have an unbelievable homecourt here." 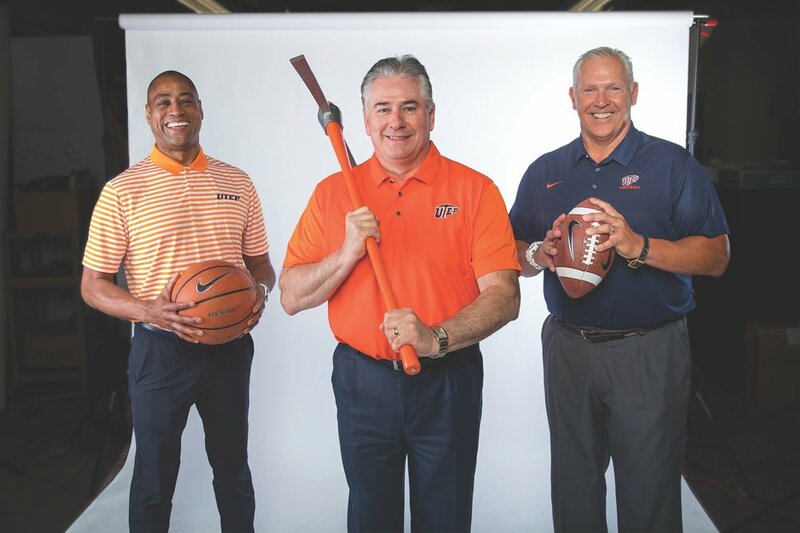 Jim Senter, UTEP athletics director, said Terry is a great fit for the University because of his connections to Texas and his proven track record as a coach and recruiter. Terry, a native of Angleton, Texas, played basketball at St. Edward's University in Austin, and began his collegiate coaching career as an assistant with the Hilltoppers in 1990. Following three coaching stints at high schools in Texas – including as the head coach at Somerville High School and his alma mater Angleton High School – Terry served as an assistant coach at Baylor (1996- 1998), UNC Wilmington (1998-2002) and Texas (2002-2011) before landing the head coaching position at Fresno State. "We are very pleased to find a coach with the talent, expertise and experience of Dana Dimel ... He will immediately impact recruiting in the state of Texas and he is a proven winner." "Rodney Terry is a great fit for the University because of his connections to Texas and his proven track record as a coach and recruiter."